Anyone can vlog. It doesn’t take much to shoot a video and upload it to Youtube. But if you want to take your vlogging seriously, you might want to sit down and think about few things before you do anything. Here are 8 important questions you need to ask yourself before start vlogging. 1. What is your vlog about? First, you need to figure out what kind of video you are going to make. This is important because different types of videos have different types of audiences. Also you have to enjoy the type of video you are making. 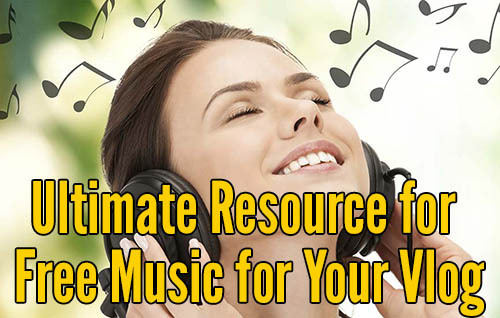 There are so many different types of video you can make. The possibilities are endless. Here are examples of different types of vlogs and videos for Youtube channel. It is important to stick to the same type of video when you start your Youtube channel because you want to attract same type of audience for your channel. If you are making a travel video and one day you make videos about video games, you are going to loose some audiences. It’s important to build consistent fan base. With that said, it is okay to experiment with different types of video in the beginning. Try to find out what works for you and see what kind of video you are enjoy making. At the same time, it is okay to combine different types of video to create your unique type of video. In the beginning, you are not going to have lots of audiences, so it is good opportunity to trying different things out and experiment. 2. 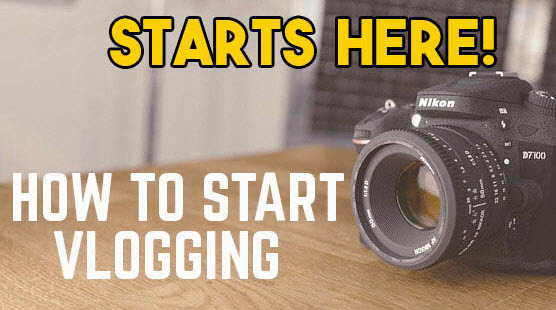 Why are you starting your vlog? Before you start your channel, you need to sit down and ask yourself why you are starting a Youtube channel. This is probably the most important question you need to ask yourself before you start. Are you starting a Youtube channel to be famous and make lots money? If this is the reason, you are in for some major disappointment. Becoming a Youtube star and making lots of money is very difficult to do and it requires lots of work and time. Yes, sometimes people get lucky and go viral with a video of their cat chasing its tail. But these type of viral videos are like winning a lotto. There are no tricks or formulas to make your video go viral. You’ll find that some of obscure type of videos go viral. It is very unpredictable. Besides, if you really get to know many of the famous Youtuber, they didn’t become famous overnight. It took them many years of hard work and some luck to make it big. In the beginning, you need to start your channel for yourself, and maybe for your friends and family. When you start your channel, you’ll discover that no one is watching. This can be very disappointing. But if you make video for yourself and friends and family, it wouldn’t bother you too much. If you are just starting out, this is good opportunity to learn the craft of video production. Since not too many people are going to watch it initially, you can really try new things and make mistakes. The video production takes time to learn. As you make effort to learn the craft, you’ll find that your video gets better and better every upload. At the end, important thing is that you need to commit for long run. Because, you never know. Many years from now, you might be the next famous Youtube star. Who are your audience you’re targeting? How old are they? Where are they located? What sort of style to they like? Take some time to do a bit of research and get some idea of your average viewer. This is important because once you know your audience, you know where they hangout. That way, you can go there to promote your videos. For example, if you audience is horror fan, you can go to different type of horror forum, Facebook groups, and Twitter to find them. You can even take this to next level. You can create different types of social media to bring your audiences together. For example, you can create Twitter account and grow it with your target audience. Then you can use this Twitter account to promote your channel. Here is great post about how to grow your Twitter. 4. How often are you going to upload? Consistency is very import to be successful in Youtube. In order to be successful, you need to have many subscribers as possible. These subscribers wants consistency. They want to watch your video in certain time in a day of the week. It is almost like watching a TV show. You expect certain shows to be on air on certain time. So you need to figure out how often you are going to upload your video. Once a week? Few times a week? Once every two weeks? Every day? But you need to be realistic. Creating a video take time, specially when you are just starting out. So you need to give yourself time. But you can’t be making a video once a year. That will not work. Giving yourself a deadline is good but you can’t be stressing yourself every time deadline is due. You’ll be burnt out very fast. So you need to create a balance where you upload the contents often enough that your viewers won’t forget about you, at the same time, still have fun making it. Making a video once a week is a good start. If you decided to make one video a week, dedicate a time and day to upload it consistently every week. 5. What is the name of your vlog? What are you going to call your channel? You should think about this carefully. Because name of your channel is basically your brand. A brand represents the sum of people’s perception of the channel. Catchy brand name can help audience to remember your channel and draw attention. So before you create your channel, it is good idea to think about a name and branding of you channel that you can stick with for long time. Setting a goal is very good thing. You should set a short term goals and eventually long term goals. Setting a goal is a good way to measure your success. Your goals may differ depending upon your reasons for starting a new YouTube channel. So it is good idea to think about your goals. Some of the short term goals maybe getting certain number of subscribers, getting certain number of total views for your videos, and maybe uploading certain numbers of videos. Your long term goal maybe getting larger number of subscribers, making certain amount of money, or evenquitting your job to become full time Youtubers. Make sure to set your short terms goals so that it can be achievable. For long term goal, think big. 7. What kind of equipments do you already have and what do you need. You don’t need expensive gears to start vlogging. But you need basic vlogging gear to start. So it is good idea to do quick inventory of all the gears you can use to shoot best quality video as possible, and figure out what gears you need to buy. First thing you need is a camera. There are many different types of camera out there, but make sure your camera can shoot HD standard in 1080p quality. If you don’t have a camera, you can always use your smartphone. Now days, everyone has some kind of smart phone. Many of the smartphones on the market have really good quality cameras built-in. But if you do need to buy a camera, you don’t have to spend lots of money to get one. 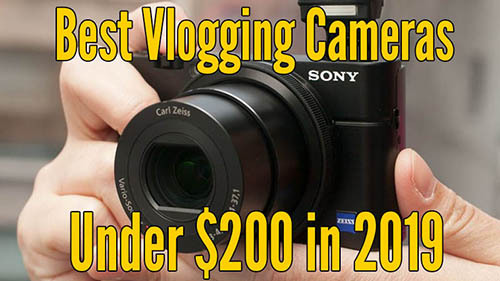 Here is list of cameras you can get under $200. It is good idea to get some kind of tripod. Many vloggers use mini-tripod such as Gorillapod. But Gorillapod isn’t the only one out there. There are many different types of brand. 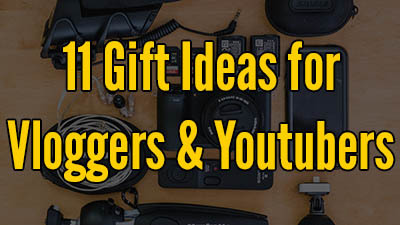 Many vloggers like them because it is easily to carry around with you. When you get your mini-tripod, be sure to get the one that will support your camera. For example, if you have DSLR camera, you do need bigger size mini-tripod. Lastly, you do need some kind of editing software. There are many free editing softwares you can use. I recommend using the free editing software if you are just starting out. You don’t want to spend money on editing software to find out vlogging isn’t your thing. But when you decided to take your vlog to next level, you do need better quality editing software. Many of free software are limited in things you can do. Here is list of free editing software you can try. I recommend not to spend too much money on camera gears and software. You don’t have to have expensive gears to make good video. Initially, you want to focus more on content of the video. As you get better, you can slowly upgrade your gears. 8. How are you going to promote? When you are starting out, you need to spend lots of time promoting your video. There are many different way to promote your videos. So it is good idea to figure out how you are going to promote your video, and what works best for you. Find out much as possible different ways to promote your videos. Social media is most common and easily way to do it. So if you are not too familiar with different types of social medias, it is good time to learn more about them, and start using them. Social media isn’t the only way to do it. You can tell your friends and families about the channel and encourage them to spread the word. You can collaborate with other Youtubers. You can join many different support group in Social media, such as Facebook, Reddit, and Google+. There are always the forum where you audiences hang out. Like I mention it before, if you know your audience, it is bit easier to promote our vlog. You can do some research and find out where your audiences hang out, and go there.